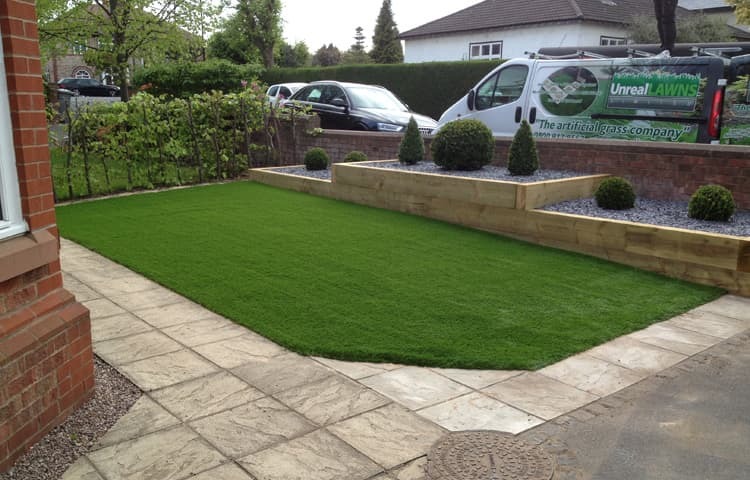 Unreal Lawns supply and install artificial grass in Hale and the north west of England. We serve domestic and commercial customers in the area, with products suitable for a wide range of applications from outdoor spaces and gardens, to event areas, exhibition space and more. See below for some examples of projects we've carried out in the Hale area. In the winter months, with the cold damp weather getting more frequent, people who have made the choice to have an artificial grass lawn fitted at their property are going to reap the benefits. No more worrying about mowing the lawn or weeding! Instead you can just sit back and relax in the knowledge that your garden will look fantastic no matter what the weather. We were contacted by a couple in Hale, Manchester who had been part of a large renovation project in the area and wanted a garden that matched their newly renovated modern looking house. Our artificial grass products suit this kind of project perfectly so we visited the property with some samples for them to have a look at and choose which when they would like to go ahead with. As you can see from the picture the garden now looks stunning and really suits the property. The customer was happy with the finished job and can now take advantage of the spare time they will have with not having to maintain a standard garden.